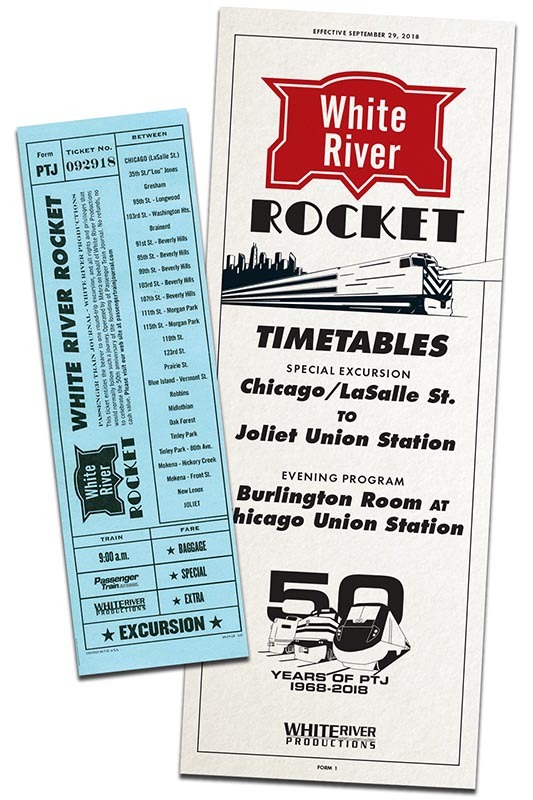 Saturday, September 29, 2018, dawned clear and pleasant over Chicago’s downtown Loop as a crowd of rail enthusiasts, current and retired railroaders and officials, and the staff of White River Productions gathered at LaSalle Street Station to celebrate the 50th anniversary of the founding of Passenger Train Journal. 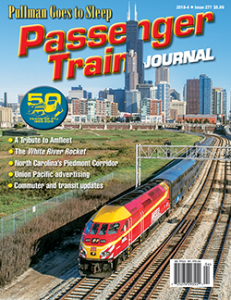 Among those in attendance were four of PTJ’s five editors during the 50 years since its founding: Kevin McKinney, Carl Swanson, former Trains magazine editor Kevin P. Keefe, and Mike Schafer, currently serving his second term as PTJ’s editor. Awaiting the deadhead arrival of the White River Rocket trainset, old acquaintances were renewed and new ones made among those present. Working with extraordinarily accommodating Metra officials, WRP chartered a six-car bilevel suburban train that normally lies idle at the Joliet coach yard for the weekend. 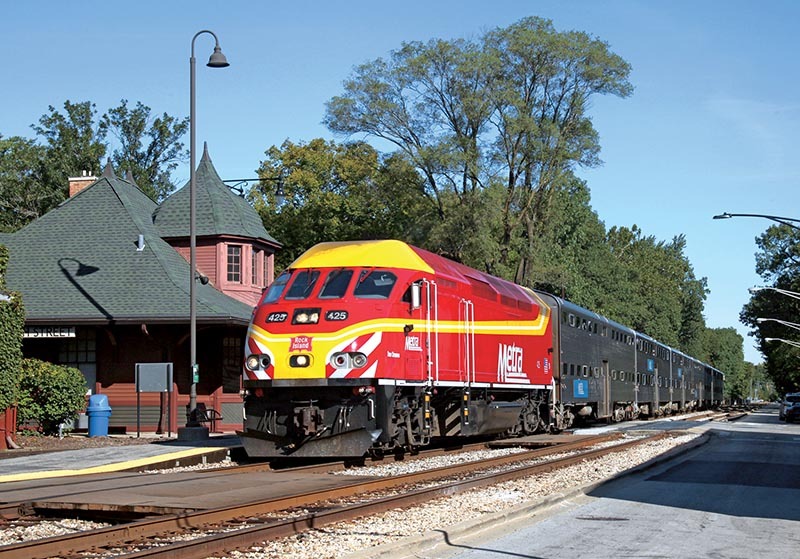 By special arrangement, the consist included MP36PH-3S locomotive 425 sporting a heritage paint scheme honoring the late lamented Chicago, Rock Island & Pacific as well as recently retired Metra CEO Don Orseno, whose name appears on the side of the locomotive (see PTJ 2018-1, p. 53). Once our spotlessly clean train rolled to a stop, Metra conductors John Vrbovski and Yolanda Philpot greeting us on the platform. Also proudly representing Metra were trainmasters Don Nelson and Marty Yock, as well as safety foreman Mark Llanuza and engineer Scott Tucker. Metra’s board chairman Norm Carlson was aboard as well, and he welcomed passengers on the train’s P.A. system. Norm is also editor of First & Fastest magazine, published by the Shore Line Interurban Historical Society, which specializes in the history and operations of Chicagoland rail transit. Our smooth, nearly on-time departure, predicted Scott’s fine train handling for the rest of the trip. Train announcements as well as historical and location running commentary were provided throughout the trip by Don Nelson. Regular Metra riders would recognize Don’s voice, which is what thousands of Metra commuters hear every day in the form of “The next station stop will be …” pre-recorded on-train messages. Don was formerly a radio D.J., having worked with Chi-cago radio’s famous Larry Lujack prior to hiring out with Metra. Our first stop was at 47th Street, the former Rock Island’s “Rocket House” locomotive facility, where passengers were allowed to disembark for a quick look at the area from what is normally only an employee platform. Our next stop was at Oak Forest for a photo run-by—the first ever for a Metra train. Once our train was unloaded, it backed down past the intermediate signals, allowing photographers to cross the tracks to the opposite platform—the best side because of morning sunlight. We first awaited a regular inbound train’s arrival and departure before Scott brought our train slowly past the station, to the enjoyment of photographers and amazement of commuters and bystanders on the platform. This all fortuitously occurred just before a solid, hard-edged line of clouds moved in which made for variable skies during the rest of the day. The next stop and run-by was at Tinley Park’s beautiful station facility, again pleasing photographers and surprising on-lookers. After re-boarding and departing, Scott put his 3,600 horses to work, quickly getting us up to track speed in order to stay within our time slot ahead of following traffic and zoom-ing past many trackside non-riding photographers awaiting our train at various locations. 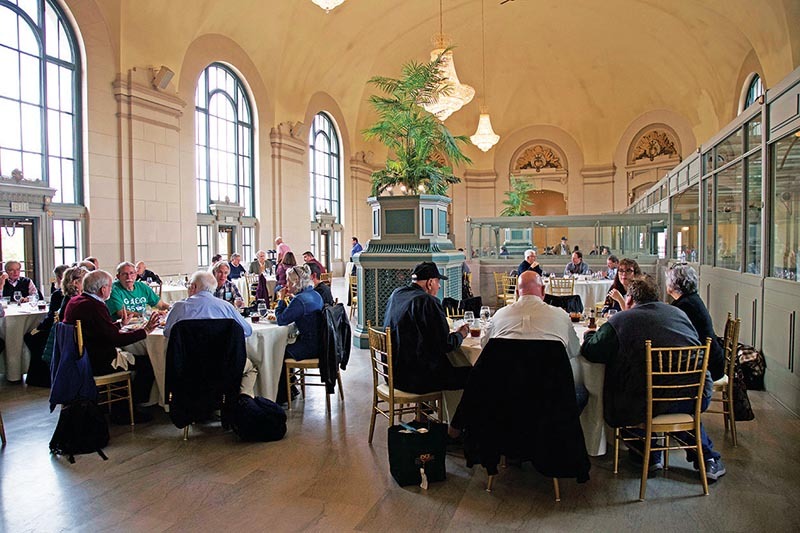 Upon arrival in Joliet around 11:15 a.m., we were treated to an excellent luncheon catered by the Grand Ballroom in Joliet Union Station’s magnificently restored former waiting room. After which we were afforded plenty of time—more than three hours—for socializing and watching the endless parade of BNSF trains hammering across the diamonds as well as Amtrak’s eastbound Texas Eagle, more or less on time. Joliet Union Station has been owned by the city for years, which rents out the former waiting room for events. Until recently Amtrak and Metra passengers used a walled-off area of the station to access trains on the west and south side platforms, but with the opening of the new Joliet station on the east side of the BNSF and Union Pacific tracks, this has all changed, although one can still access the old west side platforms. A nonstop return trip to Chicago allowed for more socializing on board the train, with our arrival in plenty of time for hitting some of the more renowned eating and drinking establishments in the Loop District prior to attending an evening of excellent audio-visual programs in the Burlington Room at Chicago Union Station. The presenters were: Marshall Beecher, George Forero, Mark Llanuza, Mel Patrick, John Ryan and Paul Swanson jointly, and Bob Schmidt, all of whose shows made for a fine conclusion to a very enjoyable day. Special thanks must be afforded to the following people for organizing and facilitating this rewarding event: Event co-chairmen Mike Schafer (PTJ editor) and Otto Vondrak (associate editor of sister publication Railfan & Railroad) for arranging venue and train charters. Metra’s train crew and officials who were our on-board hosts and who all provided an orderly, well-executed, and safe excursion. Metra Board Chairman Norm Carlson and Safety Foreman Mark Llanuza, both of whom willingly provided their time and expertise in arranging the special and unprecedented logistics for this excursion. Kevin and Nadean EuDaly, owners of White River Productions, and Kevin as publisher of Passenger Train Journal. Kevin and Nadean signed the various agreements necessary to pull off this special event, supporting the rest of us involved, all the way from the “Hey, let’s do this…!” at an editors’ meeting to the platforms of La Salle Street Station.